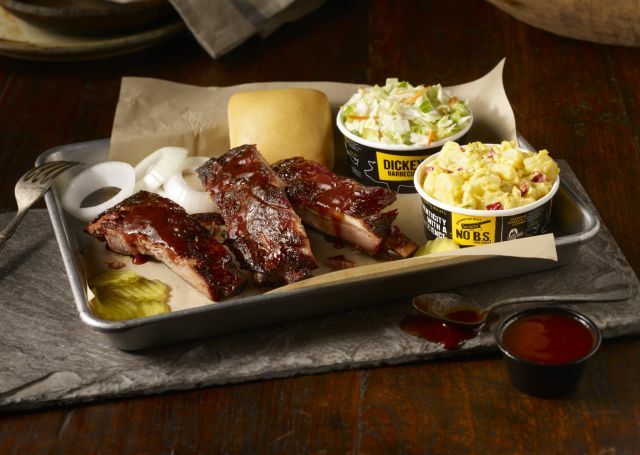 Dickey's Barbecue Pit's deal for October is an all-you-can-eat ribs special for $19.99 that runs through October 28, 2018 at participating locations nationwide. The way it works is you start off with four smoked barbecue ribs, two sides, and a buttery roll. Once you've finished with the first round of ribs, you can keep getting two more ribs until you've eaten your fill. As is typical of most all-you-can-eat offers, the deal is only available for dine-in and you can't take any of the ribs home. It's not a bad price in my area as a Pork Rib Plate, which includes five ribs, two sides, and a buttery rolls is already $17.95 (the price varies with location). Photo via Dickey's Barbecue Pit.